faithparent: Can You See Me Now? Summer vacation is just a month or so away and now is a great time to think about any checkups your children might need. Along with well-child checkups, vaccination checks, and sports physicals think about making an appointment with an optometrist. 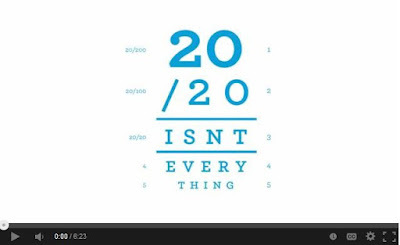 The clip above shows what happens to learners who have visual struggles not detected by a typical vision screening performed at the Pediatrician’s office or at school. Issues such as trouble switching back and forth between near and far vision interfere with learning, can cause headaches, and encourage behavior issues. A relatively inexpensive eye doctor visit can make a huge difference for a learner. Don’t count on a simple screening to tell you what is going on with your child’s vision and don’t count on your child to tell you either! Vision changes slowly and children are often not aware that they cannot see as well as before, or as well as they need to in order to learn. A child having difficulties is more likely to think she is not as smart as other children. Other students develop anxieties that contribute to behaviors that mimic ADHD. It is also not wise to assume that because glasses are not widespread in your family that you don’t need to take your child to an optometrist. Children spend much more time with screens close to their faces and this will impact vision development. Give your children every advantage in school. Introduce them to an optometrist this summer.